Parent Sandra Bedrosian Sermone, profiled in The Fight for Tony, made the initial discovery that 81 percent of children with a mutation to their ADNP gene got almost all of their baby teeth by age 1, which is unusually early. She took her data to researchers Illana Gozes at Tel Aviv University, Israel, and Frank Kooy at University of Antwerp, Belgium, who investigated and conducted experiments to determine how and why this could happen. The researchers found that mice with an ADNP mutation had tooth irregularities, suggesting that the ADNP gene affects bone maintenance. Their research, published in Translational Psychiatry, is important because it gives parents and physicians an early sign that a child might have ADNP Syndrome. "Parents with developmentally delayed children with premature primary tooth eruption may suspect ADNP mutation, which will lead to better diagnosis and better treatment," Dr. Gozes said in email to IAN. Her research team also found "interesting connections between bone/tooth and brain genes," she added. Dr. Gozes discovered ADNP and its role in brain development more than 15 years ago. The research found that 44 of 54 children with an ADNP mutation had almost all their baby teeth by age 1.1 That dental condition is not associated with any other known genetic syndrome. ADNP Syndrome usually includes autism, global developmental delays, intellectual disability, feeding problems in infancy, low muscle tone, speech delay, and certain facial features, such as a prominent forehead, broad bridge of the nose, and a thin upper lip. Many of those with the condition also have heart, vision, and sleep abnormalities. The syndrome, caused by an alteration to the Activity-Dependent Neuroprotective Protein gene on chromosome 20, is usually diagnosed through whole-exome genetic sequencing. Researchers hope the discovery of a clear early warning sign – premature teething – will alert doctors to test for an ADNP mutation in children also showing other symptoms of the condition. 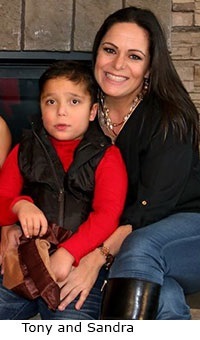 After the diagnosis of her son, Tony, Mrs. Sermone created the ADNP Kids Research Foundation, through which she made her initial discovery about teething.2, 3 She has contacted the families of more than 100 people worldwide with the mutation. Scientists believe many more are affected than that. Mrs. Sermone said she wishes Tony, 9, had been diagnosed in early childhood so he could have begun Applied Behavior Analysis therapy and oral-motor speech therapy sooner than he did. "This gives me great hope for other families who have young children, because if they can be diagnosed at such a young age, they can begin early therapies which could greatly improve the long-term outcome of that child's life, which is a wonderful thing." She credited Dr. Gozes and her long involvement in ADNP research. "I could never had moved this forward without the help of who I refer to as the ADNP fairy-godmother, the wonderful Dr. Illana Gozes. She actually deserves most of the credit; without her, we would not even know what ADNP was." Mrs. Sermone has participated in several autism research programs, including the Interactive Autism Network, the Simons Variation in Individuals Project, and SPARK, part of the Simons Foundation Autism Research Initiative.